Enjoy fresh greens at every meal no matter what the season. With AeroGrow's AeroGarden garden kit, it's easy to cultivate lettuce, cherry tomatoes, herbs, chili peppers, edible flowers, and more in an energy-efficient, organic-based environment right in the kitchen. 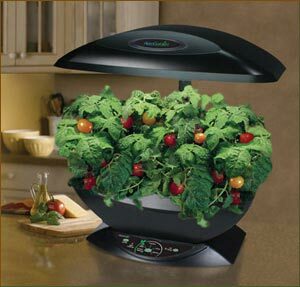 This compact chef's tool includes everything the indoor farmer needs: a preseeded bio-dome grow pod, two daylight-spectrum bulbs, nutrients, and a helpful tending and harvesting guide complete with recipes. Just follow the simple instructions to set up, and the growing process starts immediately, with germination occurring within 24 hours and a mature plant that is ready five times faster than if grown in soil. The AeroGarden system monitors itself to create ideal growing conditions for each plant and alerts you when it's time to add more water and nutrients. No dirt or natural light is needed, so even low-light spaces are suitable. Plug kits for many kinds of plants are available from AeroGrow. • No land? No problem. Perfect for gardeners in condos, high-rises, and apartments. • Garden-fresh food available all year round, "right off the plant and into the pot"
A complete seed starting or cloning kit! Combines 72 Super Plugs with standard flat and insert, tall propagation dome with built-in 2 ft fluorescent light. A unique starter plug derived from naturally composed tree bark, Super Plugs produce large populations of beneficial microbes to colonize roots and maximize nutrient uptake for robust and healthy root growth. 10.5" x 24". Sonnylight LED Grow Light system (http://www.sonnylightled.com).